a typical central square in an italian town. you can get an idea of the peculiarities that these places implicate! what is sure is that you do not have to bother about your safety - one of the many roosting men would rescue you from any dangers. hopefully. i don't know if you are informed of the special history of alghero - it is the only city in sardinia where catalan is spoken. this fact concerns with the circumstance that alghero was conquered by the catalans in 1354 and colonists from barcelona populated the city after the conquest. even today alghero is called little barcelona, barceloneta or la picolla barcelona what is due to the similarities in their townscapes. it's not what you say but how you say it. the tone of a few rebellious kids we observed in santa maria navarrese was questionable. but i want to let them get away with their rebellion - growing up and all that goes with it need strength and the ability to assert oneself. it should not be forgotten that some facts differ from country to country. therby in sardinia a wrong assumption played into our hands. wednesday seems to be a day of rest in italy, we had to learn this fact. all the shops were closed. that's why besides us almost nobody else was walking through the narrow alleys of bosa, a mountain village at the east coast of sardinia. so we could enjoy the special architecture of bosa without interruption. the port of villasimius radiated calm and rest. only a few anglers were engaged. the few boats were harboured. while the sun was setting, tina and i observed the tugboat that was reflecting the sun. favourite place! really admirable that this hampered old couple had shouldered burden and stress of a bus or an air trip - they seemed to be dutch - only for some days of sightseeing. they were walking around alghero within the context of a guided tour group. although i haven't seen any smiles playing on their lips they for sure enjoyed the experiences they had gained in this historic city. really pesky that this beggar-woman bothered the two of them. i indeed appreciate poverty and starvation of the immigrants but i'm not willing to accept a mafia-like rip-off - we met the lady later in the bus: her supposed baby was a doll. fortunately the tourists had summed up the situation - they gave the beggar the cold shoulder. especially in the first days of our sardinia trip we had spotted many of these very elemental landscape scenes where of course several photographs were shot by me. the route between alghero and bosa is simply beautiful. the impressive landscape in spring in combination with misty and foggy weather created a mysterious mood that had to be captured in an image. if someone had been sitting on this bench i'd probably have to remove this person from my scene. when you visit an european city you'd expect that free-roaming cats influence the townscape. thereby in sardinia pets aren't that high rated as the people do in germany. many cats have to run their own lives. funnily also the dogs do as they please. especially in alghero we often saw dogs walking on their own, there was no human being on view far and wide. hopefully the lined lady of my pic will get along furthermore. during the last night (almost without sleep) i have decided to use the nex free time for publishing a multi-day sardinia series on the basis of my pics from april 2012 to keep the blog alive. the wonderful island really deserves this honor, i'd definitely entrust a sardinia trip especially in spring to everybody who is interested in elemental nature. the first pic of the series shows the famous capo caccia at the west coast of sardinia. the building in the upper right corner of my image lies 110m above the sea level at the edge of the cliffs. when the waters are calm you can visit the neptune's grotto at the foot of the cliffs. the cliffs seem to be solid as a rock. but in a margin of several ten thousand years even the rock isn't more than a blink of the eye. btw: the photographs of this series will not be published at flickr because i'll have to pre-plan the postings because of a business trip next week. the time has come, the borrowed eos 400d makes way for my new nex 7. don't be afraid - otherwise everything will remain unchanged. i'm geared up to start respectively to resume my work. 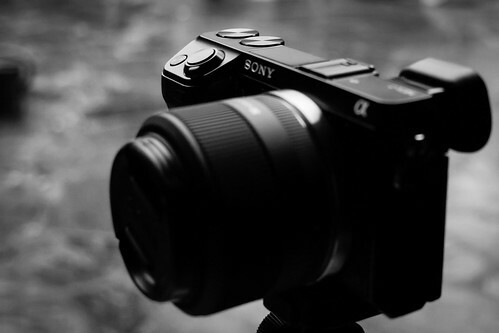 as a start my new sony nex 7 will be matched with the sigma 30 f2.8, the manual (toy lens) fujian 35 f1.7 - i'm aware of the peculiarities of this cheap cctv lens - or the sony 50 f1.8. additionally in the near future i'll be on the look-out for a wide-angel lens. i read some rumours about a native e-mount 10-18 f4.0 wide-angel zoom which would fit in with my kit very well. and last but not least i think about the purchase of the sony sel 55-210 f4.5-6.3 but before i get myself a telephoto lens i'll wait for the occurrence where i absolutely need such a thing. what more need to be said? among other things i'm going to use two 16gb sdhc memory cards, a crumpler camera bag, a second battery and a gorillapod. in some cases - if i'm satisfied with the camera's results - i'll also publish "out of camera" (ooc) jpegs because i want to show the entire capabilities of the nex 7. for that reason i'm going to use the special modes like dynamic range optimisation (dro) and high dynamic range (hdr), too. tips and criticism or simple statements are very welcome!